Soil cover | Infonet Biovision Home. Maintaining a permanent soil cover is important in conservation agriculture. it protects the top soil from soil erosion, maintains soil moisture, smothers weeds and aids in nutrient cycling. Conservation agriculture has the potential to change the face of Africa. But its success is not automatic. It faces various challenges. Switching to conservation agriculture involves a fundamental change of mindset. For example, farmers must drop their traditional practice of preparing the land with a hoe or plough, and instead rely on "biological tillage" by the plant roots and earthworms. The switch also encourages farmers to begin to see their farms as a business rather than merely a way to feed their families. Conservation agriculture involves radical changes in what extension services do. An effective way to promote conservation agriculture is through farmer field schools and other approaches that put farmers and their needs at the centre, rather than seeing them as mere recipients of advice. Such revolutionary changes require teaching, not only on the farm itself but also within schools and colleges. Extension staff will need intensive training so they can learn the necessary technologies. Field demonstrations and awareness-creation campaigns will also be needed. The mass media must be harnessed to support the campaign. Keeping the soil covered is important in conservation agriculture. But it can be difficult. Farmers have many uses for crop residues: as fodder, fencing, roofing and fuel. Livestock keepers let their animals graze on stubble. In drier areas, it is impossible to grow a cover crop in the dry season, and crop residues are a vital source of animal feed. If they are to keep the soil covered, farmers will have to protect their fields and find alternative sources of fuel and fodder. In wetter, sparsely populated areas, this is easy. In drier areas, it is more difficult. Alternatives include fencing animals out, reaching agreements with livestock owners on grazing rights, and growing special plots of fodder and fuelwood. Farmers can go a long way towards adopting the principles of conservation agriculture with a minimum of investment on their farms. But they may be reluctant to do so if they do not have clear rights to the land they cultivate. The importance, however, of the land tenure issue varies widely throughout Africa. In some countries, lack of guaranteed tenure impedes all agricultural development. Adaptation of the "Brazilian" CA to take advantage of indigenous knowledge and different agro-ecological conditions is a process - uncomfortably long. It can be hard to find seed (particularly of cover crops), inputs such as herbicides, and equipment. Crops such as tef, which has very small seeds, can be difficult to sow without disturbing the soil. And for various reasons, it can be difficult for farmers to work in groups, form organizations or get the support they need to begin practising conservation agriculture. Cover crops make up a fundamental component of the stability of the conservation agriculture system, as much for its direct and indirect effects on soil properties as for its capacity to promote an increased biodiversity in the agro-ecosystem. Cover crops are commonly grown during fallow periods, between harvest and planting of commercial crops, hence utilizing the residual moisture in the soil. Their growth is interrupted either before or after the next crop is planted, but before competition between the two crops starts. Cover crops energize crop production, but they also present some challenges. Different plants, have diverse rooting systems, explore different soil depths, have the ability to absorb different quantities of nutrients and with the production of distinct root exudates (organic acids) result in benefits both for the soil and for the organisms. The presence of a mulch layer (dead soil cover) contributes to a reduction in evaporation of soil moisture and leads to a higher water infiltration capacity in the soil profile. The percentage of rainwater that infiltrates the soil depends on the amount of soil cover provided. Whether through the effects of pores left by plant roots, earthworms, insects or other soil organisms, or through an improved soil porosity and higher number of bigger aggregates, in both cases it is accumulated organic matter that creates the favourable conditions. Crop residues left on the soil surface lead to higher soil aggregation, and higher porosity and higher number of macro pores, and thus to a higher trend in infiltration rates. As different cover crops produce different amount of biomass, the density of the residues varies with different crops and thus the ability to increase water infiltration. Cover crops contribute to the protection of the soil surface and thus to the maintenance and/or improvement of the physical, chemical and biological characteristics of the soil, including adaptation of effective soil depth through their roots. Vegetative cover is essential for conservation agriculture for the protection of the raindrop impacts of raindrops and to keep the soil shaded and with the highest humidity level possible, for utilizing and thus recycling the nutrients, and for its allelopathic and physical effects on weeds leading to a reduction in agrochemical use and thus in production costs. when biomass is incorporated in the soil a high microbial activity starts in order to decompose the material, resulting in a sudden release of a high quantity of nutrients that can not be captured by the seedlings of the following crop and thus disappear from the system. The dynamics of residue decomposition depends, amongst others, on the activity of micro organisms but also on soil meso and macro fauna. The macro fauna constitutes mainly of earthworms, beetles, termites, ants, millipedes, spiders, snails and slugs, etc. These organisms promote the integration of the residues into the soil and by doing so, modifying the physical properties through the creation of burrows. The non incorporation of cover crop and weed residues from the soil surface to deeper layers in the soil is a slow process and depends heavily on the activity of these macro organisms. The activity of micro organisms is regulated by the activity of these macro organisms, because they provide them with 'food' and air through their burrows. In this way, nutrients are released slowly and can provide the following crop with nutrients. At the same time, the soil is covered for a long time and is protected against the impact of rain and sun. In comparison, when green manure crops are mixed into the soil, a large amount of oxygen and 'food' is worked into the soil that leads to a rapid development of the micro fauna population. This big population can decompose the offered 'food' in a rather quick way but at the moment, the 'food' is finished and the microorganisms die, because they cannot sustain their way of life. At this moment a large amount of nutrients is released, that if not taken up by plant roots it can easily be lost through leaching. The whole time, after incorporation, the soil is not protected by a cover and thus is susceptible to degradation processes, resulting in erosion. There are various crop alternatives to be used as vegetative cover, like grains, legumes and oil crops. All of them are of great benefit to the soil; however, some crops emphasize certain benefits, which is useful to keep in mind when planning a rotation scheme. It is important to start the first years of conservation agriculture with (cover) crops that leave a lot of residues on the soil surface, which decompose slowly (because of the high C/N ratio). Grasses and cereals are most appropriate for this stage, also because of their rooting system, which need a shorter time to improve the soil. In the following years, when the soil shows a healthier appearance, legumes can be incorporated in the rotation. Leguminous crops enrich the soil with nitrogen and decompose rapidly because of the low C/N ratio. Later, when the system is stabilized it is possible to include cover crops with an economic function, like livestock fodder. In order to be able to successfully integrate cover crops in a production system, it is crucial to select the plants that are adapted to the different soil and climate conditions and show advantages that fit in the rotation scheme. For this, it is not only necessary to know all the agronomic details of the species, but also all specific conditions of the site where they will be sown (soil and climate) and the anticipated objectives and socio-economic conditions of the farmers. 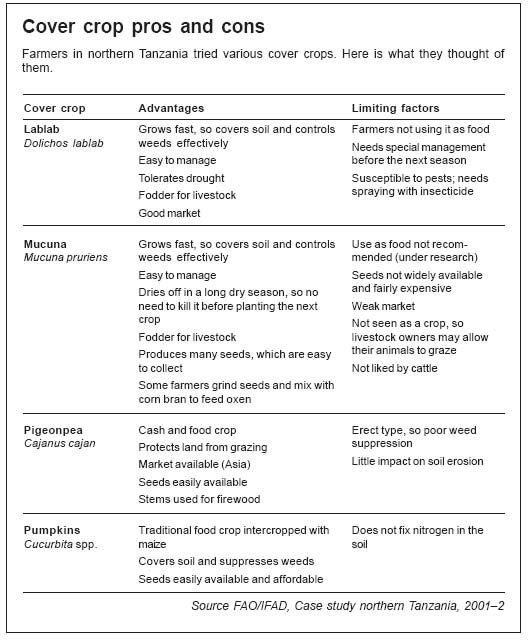 The selection of cover crops should depend on two main criteria, i.e. the presence of high leveIs of lignin and phenolic acids, which give the residues a higher resistance to decomposition and thus results in soil protection for a longer period. Another determining factor of the dynamics of residue composition is the biochemical composition of the residues. According to species, their chemical components and the time and way of managing them, differences exist in decomposition rates. Grain species show more resistance to decomposition than legumes. The latter has a lower C/N ratio and less lignin content and thus is subject to a rapid decomposition. Because one of the main objectives of a cover crop is the protection of the soil, their resistance to decomposition should be one of the criteria for selection. In addition, for tropical and subtropical cover crops the resistance to decomposition has been researched. Pearl millet followed by pigeon pea, white mucuna and Cratalaria paulina demonstrated higher resistance and left more soil cover for a long period than the other crops. Therefore, these crops are better suited as a cover crop, especially during the first years of conservation agriculture than other crops. Generally, the type of crop and the management afterwards determine the quantity of resides produced, the soil cover generated and the time the cover remains on the surface before being decomposed. Root extension, soil moisture, soil life nutrient uptake etc. Upper extreme limit - 30-35 degree Celsius ; lower limit 15-20 degree Celsius. Maize - every 1 degree Celsius increase in soil temperature above 30 degree Celsius cause 10% reduction in yields. Soil cover - reflect sunlight, absorb some radiation (insulate soil). Hence soil under cover receives less heat. Less heat - less evaporation - increased moisture - cooler soil. Select crops that cover the soil quickly and give less work for land preparation, weeding, producing and harvesting the seeds. Species with big pods and grains like pigeon pea and mucuna are easier to deal with than species with small pods such as vetch and grasses. It is important to choose the precise moment at which the vegetative cover is to be controlled, because most of the species used can regenerate if their growth is interrupted prematurely. Alternatively, mature seeds of the cover crop can germinate if the plants are allowed to mature. There are, however, species and rotations where cover crops are purposely brought to maturity to establish a seed bank which would allow the cover crop to grow automatically once the cash crop has been harvested. The best moment to control the majority of cover crop species is at full flowering when they have accumulated maximum biomass. In case of legumes, the pods from the first flowering should be already formed but not yet mature. For oats and rye, the best moment to manage is the milky stage. Forage radishes can be slashed at any growth stage, but in systems of direct sowing and minimum tillage, seeds should be green and physiologically immature to avoid the germination of new plants. Both Crotalaria and pigeon pea need to be controlled before flowering due to high re-growth rate and excessive wood development. The most adequate form to manage the cover crops depends on the objective of the cover crop and the possibilities of the farmer. In case the dead mulch should cover the soil as long as possible, the best way to manage the biomass is by using knife roller, chain or sledge. When the decomposition process has to start immediately in order to release the nutrients it is recommendable to slash or mow the cover crop. Research shows that the period between slashing/management of the cover crop and seeding of the commercial crop (maize, beans, soya, etc.) defines the production level of the crop. This is related to some of the substances that are released during decomposition of the cover crops. These can harm the germination of the seeds, or sometimes even delay the development of subsequent crops. This is called allelopathy. In general, management of leguminous cover crops ten days before planting of maize gives highest yield responses. Mixed cropping is not a new agricultural activity; for generations, farmers have grown maize and beans in association and legumes are sown into pastures with the aim of improve the grazing quality of the pasture. Associations of crops have numerous benefits in production systems. Effect on nitrogen availability in proper quantities and adequate moment for subsequent crops and providing soil cover for a longer period are some of the positive impacts of cover crop mixtures. 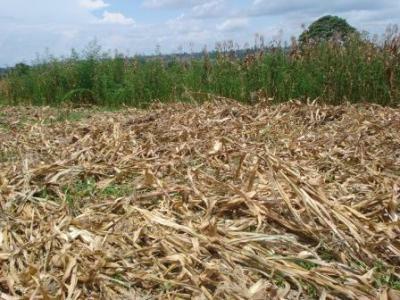 Crop residues can be an effective source of nitrogen for grain crops, like maize, sorghum and others with a high nitrogen demand, provided that the nutrient release from the residues is synchronized with the demand from the crop. Therefore, the ideal crop association is the one that offers enough residues to provide a 'pool' of mineral "N" from decomposition to attend to the commercial crop. The strategy for crop associations is to look for species from different families that have different C/N ratios and lignin contents, and that are able to contemplate with both the supply of nutrients and the provision of soil cover for a long time. Mixtures can be made from cereals/grasses and legumes, cereals/grasses and oil crops or even mixing 2-3 or more species that besides presenting an important impact on the improvement of soil properties produce a C/N ratio that favours a gradual nitrogen mineralization. In general, when residues of grass species are mixed with residues of legumes no immobilization of nitrogen will take place and the gradual mineralization favours the availability of nutrient s for absorption by plants. Millet+sorghum; millet+Crotalaria juncea; pigeon pea+sorghum; cowpea+millet; sorghum+ Crotalaria juncea. Mixed cropping is another form of crop mixtures. For instance, maize can be mixed with pigeon pea and Crotalaria juncea both planted when the maize plants have reached a height of 30cm by using the same machine as for planting maize. In Latin America very common practices include the mixture of maize with Mucuna or Canavalia in both cases planted about 80-100 days after the maize was planted. After the maize harvest these species accelerate their development, completely overgrowing the maize residues. Subsequent crops can include beans, sorghum or sunflower. When to plant cover crops? This involves planting legume cover crop at the same time as the main crop. This is easy because you can plant both crops at the same time. It is suitable for sub-humid and humid areas. A possible problem is that the cover crop might grow so quickly that it smothers the main crop. Also, you cannot plant a cover crop this way if you are already intercropping a cereal (e.g., maize) with beans. This involves planting the legume cover crop when weeding the main crop. This is suitable for sub-humid and humid areas. You can plant the cover crop when you do the first weeding (usually about 4 weeks after planting the main crop). Or if you are intercropping maize and beans, you can plant the cover crop when you harvest the beans. This involves planting the legume cover crop after you harvest the main crop. In dry areas, you can plant the cover crop when you harvest the main crop. This prevents the cover crop from competing for moisture with the main crop. You can use the cover crop to provide extra mulch and to produce livestock feed. Harvest water to make sure there is enough moisture to grow the cover crop. If you live in a semi-arid area with only one rainy season, you can plant a drought-tolerant cover crop such as lablab between your rows of maize. Leave the cover crop in the field after the maize harvest so it covers the soil and suppresses weeds. Before the next season's rains, slash it or roll it, and leave it on the ground as mulch. How to plant cover crops? In conservation agriculture, cover crops are planted directly with minimum soil disturbance. You can plant a cover crop as an intercrop (or relay crop) or in a pure stand. For cover crops with large seeds, plant with a hand hoe, jab planters or animal drawn direct planter (for pure stands). You can broadcast cover crops with small seeds (such as finger millet), provided the soil cover is not too thick. If the soil cover is thick, sow the seeds in lines by hand or use a seed drill. The plant spacing and number of seeds per hole depend on several factors. Use a wider spacing in drier areas, so the plants don't compete with each other for moisture. The number of seeds per hole depends on the amount of moisture available: fewer seeds per hole in dry areas; more in wetter areas. In general, plant 2 - 4 seeds per hole. How can farmers obtain cover crop seeds? Do cover crops need weeding? Yes! You will need to weed cover crops at least once while they are becoming established. Once they have covered the soil well, they will prevent most weeds from germinating. If you are intercropping or relay cropping your cover crop with maize or sorghum, plan to weed according to the requirements of the cereal crop. Make sure the cover crop does not tangle with the cereal crop. Rotate the types of crops grown: food, cover and cash crops. Select cover crops that are unlikely to be attacked by pests. Plant various different types of cover crops. Harvest the seeds before you slash a cover crop to make mulch. You may need to harvest the seeds for several reasons: so you can plant the cover crop next season, if you want to use the seeds as food or fodder, or if you want to sell them to other farmers. Collect seeds from several plants so you get a range of seeds. Dry the seeds and treat them with insecticide. If you want to use the seeds for food, make sure that the insecticide is not harmful. Keep seeds for planting in partly opened bags or in containers in a well ventilated store. Take the seeds out and dry them again regularly. Throw out any bad seeds. At the beginning of the next season, your field may have a cover crop, stalks still standing from the previous main crop, and of course, weeds. You need to prepare the field so you can plant the next main crop. You can do this in several ways: by slashing the cover crop and weeds with a machete or hoe, using a knife roller to bend over and crush the standing vegetation. It may be better to use a knife roller to crush the vegetation rather than slashing it, because equipment such as rippers and planters can easily drag pieces of vegetation along with them. Mulch is dry, vegetative material used to cover the soil. It helps reduce evaporation and retain moisture, reduce soil erosion, suppress weed growth and provide plant nutrients as the material decomposes. Mulch can be used in fields before and after planting, as well as around young crop plants. It is especially useful for high-valuable vegetable crops, and for growing crops in dry areas, during dry-season cropping, and in places where the soil is easily eroded by heavy rains. Where soil erosion is a problem, slowly decomposing mulch material (high carbon content, low nitrogen content, high C/N) will provide a long-term protection compared to quickly decomposing material. Mulch keeps the soil underneath moist longer than bare soil. Controls soil erosion by cushioning the impact of raindrops and by slowing runoff. Suppresses weeds by shading them out. Leads to healthy crop growth. It can introduce new pests and diseases into a field. Dead plants for use as mulch may not be available. 1. Carry to the field the material you want to spread as mulch. 2. Spread it on the soil using your hands or a rake. Put a layer of mulch 7-15 cm (3-6 inches) deep all over the bed, or around the growing plants. Do not put on so much mulch that you bury the plants or shade them out. Use dry plant material that does not rot quickly. Don't use wet or green material as mulch. Some organisms can proliferate too much in the moist and protected conditions of the mulch layer. Slugs and snails can multiply very quickly under a mulch layer. Ants or termites which may cause damage to the crops also may find ideal conditions for living. When crop residues are used for mulching, in some cases there is an increased risk of sustaining pests and diseases. Damaging organisms such as stem borers may survive in the stalks of crops like cotton, corn or sugar cane. Plant material infected with viral or fungal diseases should not be used if there is a risk that the disease might spread to the next crop. Crop rotation is very important to overcome these. When carbon rich materials such as straw or stalks are used for mulching, nitrogen from the soil may be used by micro organisms for decomposing the material. Thus, nitrogen may be temporarily not available for plant growth (risk of N-immobilization). When organic material is applied to the soil, the decomposing microbes multiply quickly. For growth, they need nutrients, especially nitrogen, like plants do. If the applied plant material does not contain sufficient nitrogen, the micro organisms will take it from the soil. This process is called nitrogen immobilization, as the nitrogen is fixed temporarily in the microbes and released only after some time. During this time, the microbes compete with the plants for nitrogen and the crop may suffer from malnutrition. Mr. Anthony Owino Malowa of the Mariwa Farmer Field School and who is practicing conservation agriculture is HIV positive. 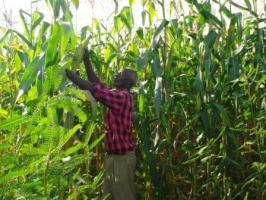 Although he is weak, he practices conservation agriculture because it requires less labour. He no longer ploughs his field but uses the jab planter to plant directly. Since he adopted conservation agriculture, the weeds in his half-acre field were greatly reduced by intercropping maize with Dolichos lablab. However, in the 2005 long rains his farm, where he intercropped lablab with maize, never gave him any yield because lablab smothered all the maize. He discarded lablab as a cover crop even though it suppresses weeds, calling it a very dangerous weed. 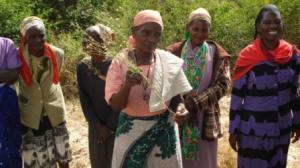 Mama Benta Odipo of the Tumaini Farmer Field School decided to plant beans as her main crop during the 2005 short rains. But after two weeks she decided to plant mucuna in between the rows, believing that after a short while, she would harvest her beans and have her soil covered with mucuna. It was a mistake. She never harvested any beans and there was no sign they had even been planted. This made her rethink using cover crops and she is contemplating leaving it out of her farming. Eyhorn, F., Heeb, M., Weidmann, G. (2002). IFOAM Training Manual for Organic Agriculture in the Tropics, Compiled by FiBL. Gachege, C.K.K., Wamuongo, J.W., Mureithi, J. G. and Eilitta, M. (2006). Development and Up-scaling of Green Manure Legume Technology in Kenya. 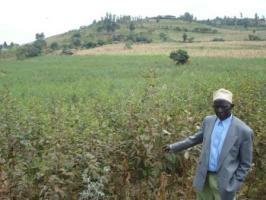 KARI; Legume Research Network Project. IIRR and ACT (2005). Conservation agriculture: A manual for farmers and extension workers in Africa. International Institute of Rural Reconstruction , Nairobi; African Conservation Tillage Network, Harare. ISBN 9966-9705-9-2.